It’s 1st July on Sunday and that’s when the #ReadtheWorldathon starts. The Read the Worldathon in a month-long readathon that I’m co-hosting with A Novel Haul and Ninja Book Box. 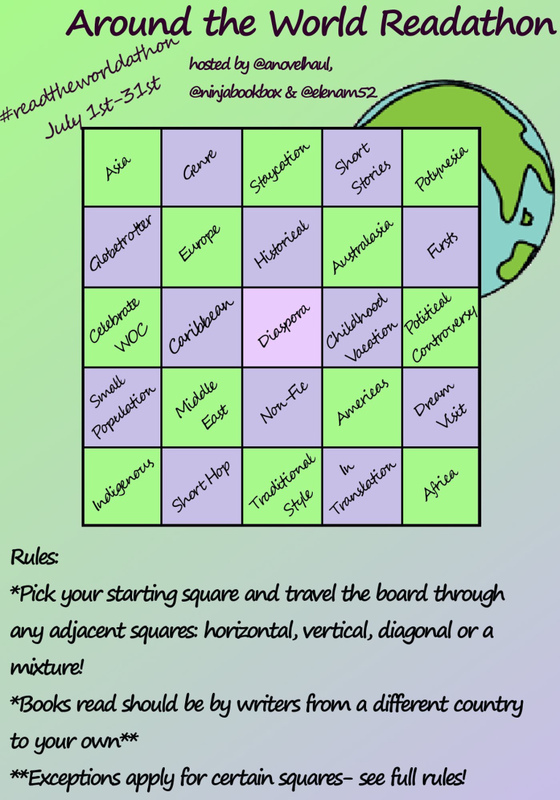 The aim of this readathon is to read books from a variety of different countries and there’s a bingo card you can “travel across” to make things more fun. For more info and an explanation of all the squares, see my announcement post here. Now onto my TBR. I’ve planned my route across the bingo card, as you can see I have two possible routes, one taking 7 squares and one taking 5 so if I’m running out of time in the month I’ve got some options. I’ve also said what other squares a book can be used for in case anyone might have it and be unsure of where best to use it for themselves. I have the ebook of this. I stumbled across it when browsing books on my kindle and it’s a highly praised detective story. I’m really looking forward to this one. Set in 1982 on the precipice of something major happening, a boy is distracted by Ma Taffy asking him, “Kaia, I ever tell you bout the flying preacherman?” I bought this book second-hand in London at the beginning of the year I know next to nothing about it. I have two choices for this square. This is an audiobook I have borrowed from my library. It’s about two long-time friends who grew up together in war-torn Beirut. A collection of short stories that was a recent purchase and the only thing I know about these short stories, is apparently they can be a bit weird and satirical. A memoir from footballer Ilir Berisha. I’ll admit he’s not a footballer I know of, but I think it’ll be an interesting insight of what it’s like growing up in Kosovo – a country that’s not recognised as its own independent state by some countries. Another book I’ve got on my kindle. This sounds like a potential sad autobiography as Christina Rickardsson was born in Brazil but at the age of seven she was taken to an orphanage and then to a village in the north of Sweden. Another square where I’ve got some choice. Aung San Suu Kyi is a politician in Myanmar and this collection of letter from her are about how she sees her country and its people – both the good and the bad. Thirty Days is about a musician who moves to the countryside to be with his girlfriend, and how they and a local doctor start to Afghans and Syrians at a refugee camp – something the locals do not like. And my final square offers me some choice too – I’m all about the choice when it comes to TBR’s for readathons! Another audiobook from my local library. This is about a man who’s kept his past a secret but when he gets ill, he starts to share how he came from Africa and made a life for himself in the UK. Other squares it can be used for: ? I think this book is about the relationship between a son and his mother and how it becomes strained when his absent father renters his life. That’s my TBR for the next month! I hope to manage to make my way across the bingo card and if I do manage to read all these books, I do have some other books I could read for random squares on the card. Do let me know if you’re planning to take part in the #ReadtheWorldathon – I would love to see your TBR’s! I’d also like to know some of your favourite international books or authors too. There’s so many books out there from so many countries, there’s just not enough time to get them all. I’m very excited to share with you all a readathon I am co-hosting next month. As some of you may be aware, I’m attempting to read a book from every country in the world by the time I’m 30 and I’m not doing too badly. At 4 months shy of my 27th birthday I have read books from 48 different countries and have about 150 to go (the exact number of countries in the world can be debated) but to give me an extra push this summer there is the Around the World Readathon which is taking place for the whole of July. This readathon was the brainchild of A Novel Haul and I’m very happy to be co-hosting with her and NinjaBookBox. Make sure you check out their blogs and follow them on Twitter (@anovelhaul and @ninjabookbox) and Instagram (@anovelhaulreads and @ninjabookbox). To make this readathon interesting we have a bingo card. The basic idea is to get a bingo by reading a book per square that fits each theme. 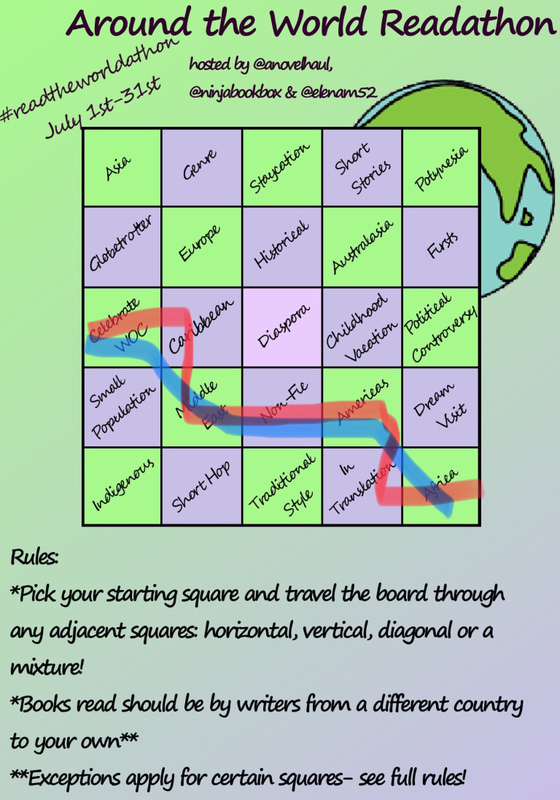 As this readathon is all about travelling, once you pick a starting square, you can “travel” in which ever direction you like across the board – you can move horizontal, vertical, diagonal and a mixture of all three. As long as you start on a square on one side on the board and finish on the other side, it doesn’t matter how you get there. Exceptions apply to the Staycation square (see below) and also to the Diaspora, Celebrate WOC and Indigenous squares. Feel free to read a book by someone in the same country as you for those if they otherwise fit the theme of those squares. Most importantly: be courteous when discussing books from other countries. Remember that writers of colour do not exist to educate and the phrase ‘this book didn’t teach me enough about the culture’ is often used to invalidate their work. Think about the story rather than just using the book as a learning experience. Geographical squares: (Asia, Polynesia, Europe, Australasia, Caribbean, Middle East, Americas, Africa) Read a book by someone from a country in that area. Staycation: Read a book by someone from your own country, whether that’s the country you’re living in or if the author has the same nationality as you. Short Stories: Read a short story collection from another country. They don’t all have to be from the same country or same author in the collection. Globetrotter: Read a book that was written/is set the furthest away from where you are now. Historical: This could be non-fiction or the historical fiction genre, you choose! Genre: Pick up some genre fiction! Fancy some Scandinavian crime? Nigerian sci-fi? Indian romance? Non-fic: Find out something new about a country! Memoirs, travel diary, biography – anything you like! Firsts: This is one you can interpret however you like. The authors first novel published? Their first translated novel? A book from the first country you visited? First time you’ve heard of an author? Childhood Vacation: A book from a country you visited, or learnt about, as a child. Political Controversy: A book by an author that has been controversial in their country. 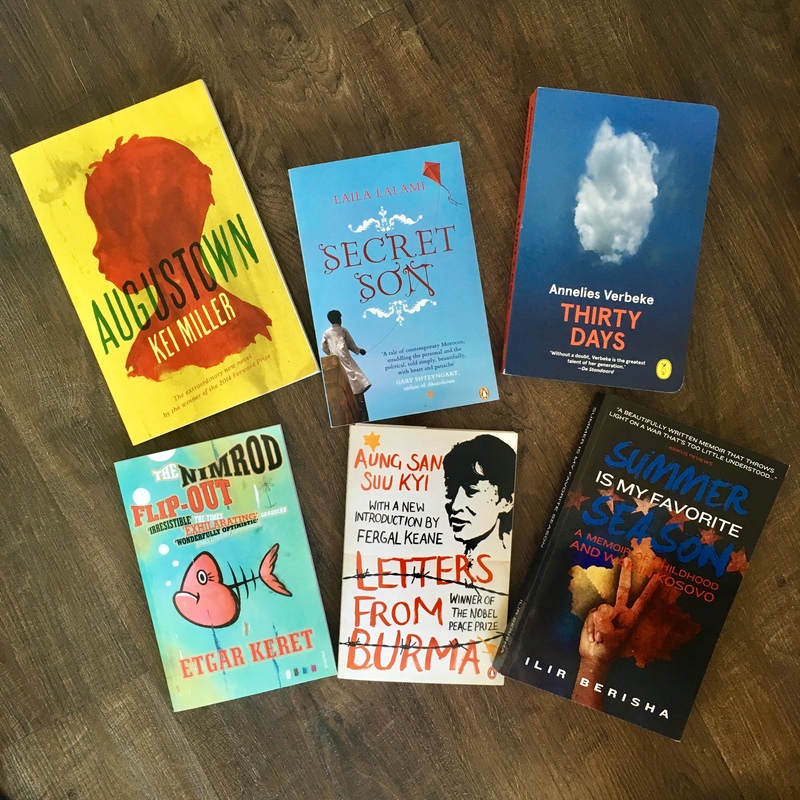 The Hamid Ismailov’s and Aung San Suu Kyi’s of the book world. Small Population: A square for those smaller countries that might be overlooked. You define what ‘small’ is, but think Malta, Montenegro, Monaco. Here’s a list of the 25 least populated countries in the world if you need a little help. Dream Visit: A book from a country you’d love to visit. Short Hop: A book from a next door country, one that’s not far away from your own. Traditional Style: Magical realism, spoken word, haikus… anything traditional! In Translation: I think this one is self-explanatory. Indigenous, Celebrate WOC and Diaspora: These squares were added because indigenous writers and WOC are grossly undervalued in publishing and diaspora perspectives are also often ignored. There is nothing to stop you choosing writers of colour, indigenous writers or diaspora writers for every square, A Novel Haul just felt they needed proper representation on the board! I will be sharing some recommendations for the various categories soon, as will my fellow co-hosts, and I’m putting together my TBR at the minute once that’s finalised I’ll be sharing that too. Do let us know if you’re thinking about joining in the Around the World readathon by either commenting below or using the hashtag #readtheworldathon on social media. Would be great to have as many people as possible reading internationally in July! Another April has gone by and that’s another A-Z in April challenge completed. This year, my theme was my favourite songs – I featured a lot of different artists from different genres and decades, and here they are if you missed any. It’s been just over a week since the April A-Z Challenge ended for another year and I’m very happy to say I completed it for the fifth year in a row! Can’t quite believe I’ve been taking part in this challenge for five years now, and that means I’ve been blogging for over five years! Time flies when you’re having fun. My theme this years was My Favourite Songs. I was quite lucky in the sense that I found it pretty easy to find songs for every letter, the difficulty came when I would have about five great songs that I loved for one letter and had to figure out which one would be the chosen one. I found it easy to write each post and I had them all scheduled before the end of the month. I do wonder if because each post was made up of a music video, whether my actual written content wasn’t as good compared to my content generally. The reason I say that is because if I’m honest I sometimes wrote the posts without much real thought, and sometimes I found it difficult to say more than “this is a song I love a lot” and that’s it. I think my content had an effect on how people interreacted with my blog this year. Compared to last year, I received more visitors but less views and comments which I found interesting. My top three most popular posts of the challenge were Take a Hint, Under Pressure and Mr. Brightside which I think shows off both my eclectic taste in music and the people who came to my blog. I also did a terrible job at visiting other people’s blogs. I would always try and respond to comments left on my blog (they may be about a week late, but I generally responded to them all – sorry if I missed yours) but I rarely visited peoples blog either via comments left on my posts or by finding blogs through the Master List. April was a bit of a hectic month for me and my mind wasn’t really on blogging in general never mind focusing on the challenge itself. It’s a shame because reading other people’s A-Z posts is always such a joy but I missed out on it this time round. I think for next year, the best way for me (and potential readers) to get the most out of this challenge is to think ahead and start writing posts for the challenge months in advance. This year’s challenge kind of crept up on me and I didn’t sign up till a week before the challenge started – leaving me with a lot of work to do. That being said, as I was kind of apathetic to the challenge this year I am considering I might take a break from it next year. We shall see how I feel in early 2019. I hope all those of you who took part in the challenge had a great time and you achieved what you set out to do. For more information on the challenge and to find many other blogs who participated, check out the blog. 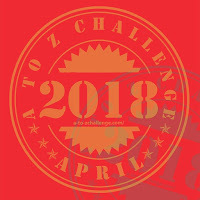 April begins next week and that can only mean one thing – the A-Z in April Challenge is back! This year’s challenge has kind of crept up on me but I have a theme, a good idea what each post will be for each letter, and I just need to write them. But first some information on the Challenge. The challenge is to post on your blog, every day of April bar Sundays. Since there are 26 days in April (not including Sundays), that matches the 26 letters of the alphabet. This year will be my fifth year in a row participating in the challenge! Five years with this blog have just flown by! I did want to have a theme that was something to do with forgotten women in history but due to my late planning I feel I wouldn’t be able to give that sort of topic justice. Instead, I’m embracing my musical side and each letter of the alphabet will correspond with the title of one of my favourite songs. I don’t really post about music a lot here, so it’ll be a chance to sample my musical tastes. There will be old favourites and new ones so expect an eclectic mix of genres and music from a variety of decades. During April I should still have my usual film reviews on Mondays, book reviews on Thursdays and my MCU rewatch reviews on Saturdays – there will just be a lot more music here than normal. To find out more about the challenge, visit the blog and you can check out what I’ve done for the challenge on previous years here. Do let me know if you’re planning to take part in the A-Z Challenge – I love to see what people put as each letter, especially some of the harder ones like Q, X and Z! It’s that time of year again where I start finding some interesting challenges and I decide to sign up for a bunch of them. To save space I’m going to put all the challenges I maybe somewhat foolishly sign up for here. Over on Twitter I saw the hashtag #BeatTheBacklist doing the rounds and after checking it out I knew I had to sign up for the challenge. Beat The Backlist is hosted by Novel Knight and the challenge is to read books during 2018 that were published before 2018 – thus not letting us forget about the potentially awesome books that are sitting on our shelves just because a shiny new release has come out. My target is to read 30 books published before 2018 – a target I should meet as I the majority of my reading is “older books” and my physical TBR is close to 100 hundred books so I’ll have plenty to choose from. There’s Instagram challenges as well as the chance to win points for your team (I’m a Novel Knight!) if you post reviews of your Backlist Books on your blog/Goodreads as well as on retail websites like Amazon. 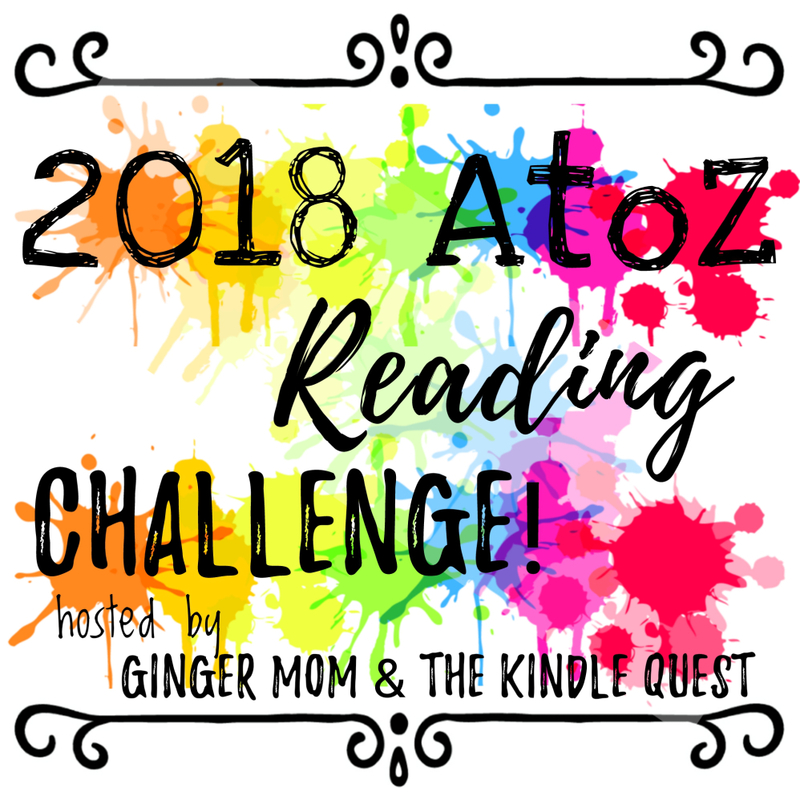 Another challenge I’m signing up for is the A to Z Reading Challenge hosted by Ginger Mom Reads. The aim is to read books that start with every letter of the alphabet during 2018. Words like “The”, “A” and “An” don’t count as a title, instead it’s the following word that counts towards a letter, and you don’t have to read books in alphabetical order. Having a quick look at my physical TBR, I have books for every letter but Q, X and Y at the moment, so this challenge is doable. Plus, you have one “Freebie” you can use for a letter that you can’t find a book for. So for example, if I couldn’t find a book I wanted to read that began with X, I could choose any other book beginning with any letter and put it as my X read. A Freebie can only be used once so I better make it count. 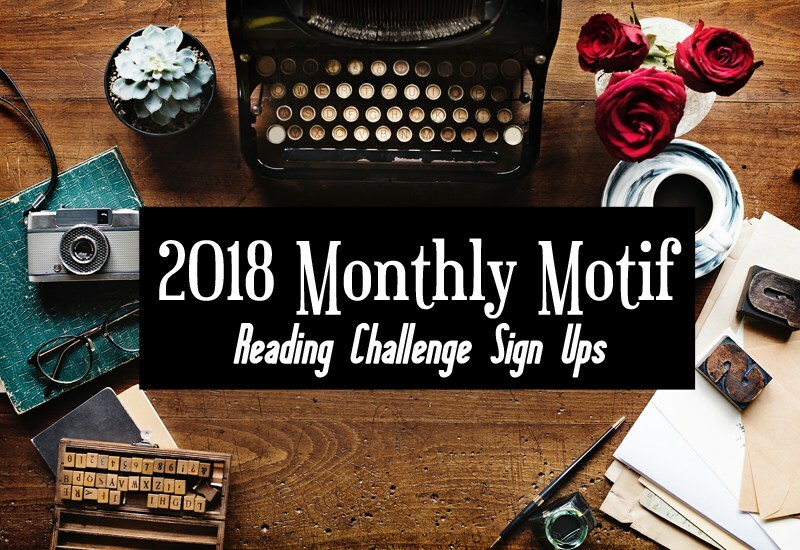 The final challenge I’m signing up for (at the moment anyway) is the Monthly Motif Reading Challenge hosted by Girlxoxo. This challenge is to read a book that fits the assigned motif or theme for each month. I like how each theme is pretty broad so there’s a lot of choice when it comes to deciding what books to read while still making it a challenge. November begins next week and that means Non-Fiction November is back! It’s a readathon/challenge hosted by ABookOlive and NonFicBooks on YouTube. As the title suggests, the aim of the challenge is to read more non-fiction than you normally would in a month. There are four challenges for this readathon. They are four words that can relate to the books you read and they are Scholarship, Substance, Love, and Home. You can apply these words to non-fiction books however you like but the challenges are a choice, you don’t have to use them. 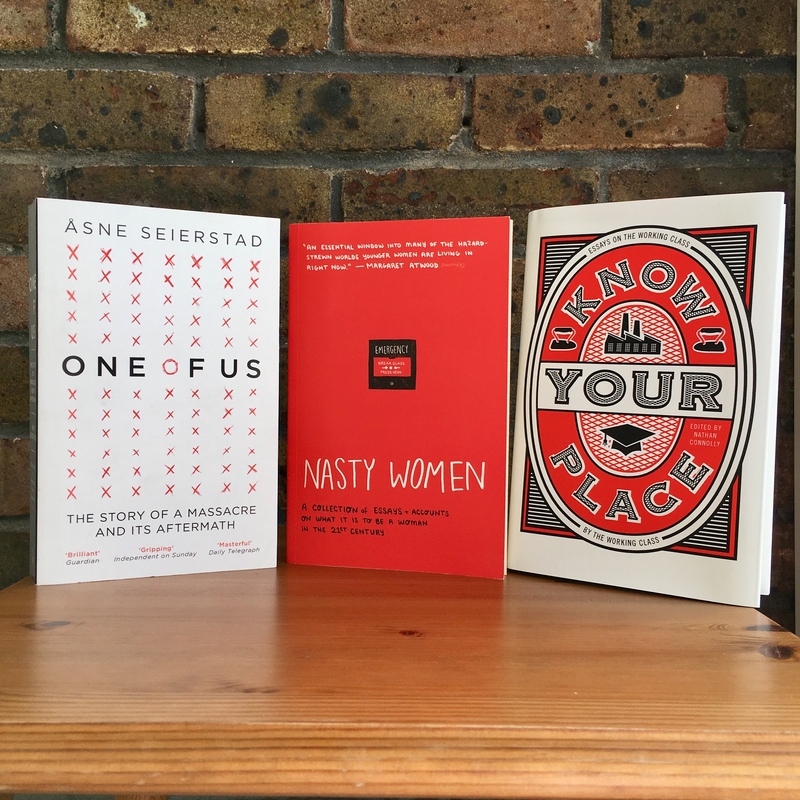 I’ve got a few unread non-fiction books sitting on my shelves but I’ve just chosen just three for my TBR as I like to vary what I read. None of them really fit the challenges as I picked the books before the challenge words were revealed, but I’m not too fussed about that. One of Us is about the terrorist attack in a Norwegian summer camp in July 2011. I got it for my Read the World project and it’s a bit longer than I thought it’s be (it’s a bit over 500 pages) so Non-Fiction November definitely gives me an extra push to read it sooner rather than later. I can imagine it being a tough read, especially as it has testimonies and interviews with those involved with the attack and the subsequent trial. This is a collection of writing from various British female writers that I backed on KickStarter. It was put together as a response to Trump’s election and the general attitudes women are facing in in the twenty-first century. I’m really into feminist writings and just generally learning more about what different women go through in day to day life. This is another essay collection I backed on KickStarter (I love backing books on KickStarter) this one is essays on the working class, by people who are a part of the working class. I suppose you could say I’m a part of the lower middle class, so I haven’t had it as difficult as many people, so I’m keen to learn more about what life in the UK is like for such a big proportion of the population. I’m looking forward to reading these books, as I always say with readathon challenges, if I read one book from my TBR I’ll be happy. Are you going to be taking part in Non-Fiction November? The hashtag to use on all social media channels is #NonfictionNovember2017 and there’s a Goodreads group as well.